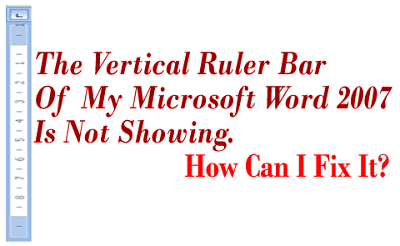 If the vertical ruler bar of your Microsoft Word 2007 is not showing, it means that it has been turn off. 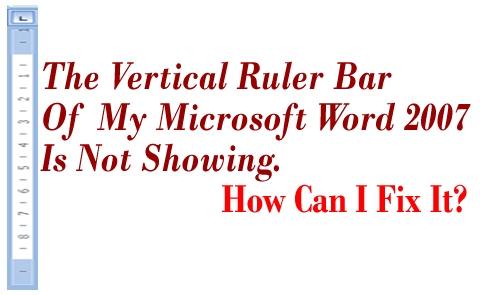 This means that only horizontal ruler bar will be showing in your Microsoft Word 2007 document window. To fix this issue, you need to turn on the vertical ruler. Follow the guide below to fix it. Click the Microsoft Office Button, and then click the Word Options button located at the bottom-right of menu it displays. Next click Advanced, in the left section of the Word Options dialogue box it displays. Then scroll down the Display section, and check the box before the Show Vertical ruler in Print Layout view. Finally, click OK at the bottom of the dialogue box to apply and make the change take effect. That is all. Your Vertical ruler bar will be back to where it suppose to be.